What are your favourite priority orders? I'm fiddling with LRR again and to prevent you all pain when loading up a level and rearranging the priorities, I'm curious as to what order you want priorities in. Simply rearrange them here and you will rearrange the order in which they show up when you start a level. Reinforcing must be in front of shovelling. Else raiders shovel a landslide, get landslided upon, shovel it, get landslided upon, shovel it, get landslided on, get teleported out. Shovelling must be in front of crystal and ore collection, else they leave land half-shovelled. This is a right pain when you only have 4 raiders on foot and 5 raiders in STTs. Crystals are obviously in front of ore. Repairing is the top priority. Abandon your posts and repair my buildings.... if they're not smashed to pieces already. Recharging crystals is higher than getting new ones. This is because only raiders can recharge crystals when STTs cannot. Thus, if getting new crystals was higher than recharging crystals, the raiders would pick up the crystals and my STTs would idle; an unwanted situation. And I'd be losing out on crystals. Building is above both shovelling and energy crystal collection. It's a right pain having to wait for barriers, and again STTs cannot carry them; thus the sooner I get the barriers down the better. Drilling is above ore. This means that my raiders will drill a wall instead of picking up ore. However, lategame I move ore above drilling, because I now have specialized drilling vehicles that can do nothing but drill, and hence no matter how far down it is they'll do the drilling. I don't want raiders trying to drill when I have a Chrome Crusher right behind them! "Get In" vehicle is at rock bottom because I always teleport down a vehicle, then teleport a new raider to go in that vehicle. I have almost never used the Get In function in nearly 20 years of LRR, because a person with a Laser Beam may get into the vehicle; activate Action Stations and that vehicle will idle, rendering both a vehicle and a raider useless. What are your favourite priorities? Anything different? Type them or post a screenshot! As for the unused priorities, Barrier and BuildPath both work, though BuildPath is actually useful and makes for a great replacement for Construction. BuildPath doesn't regulate your Raiders actually building Power Paths, but it regulates the priority of them finishing the paths. This is extremely useful for lava erosion missions, since you'll want your raiders to finish paths instead of picking up ore on the same tile. 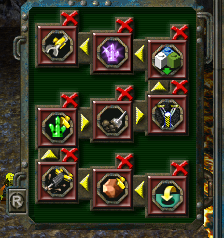 If you don't want to activate the priority, set Ore collection to 8th or 9th on the priorities list. BuildPath, like the Electric Fence collection, seems to have an internal priority level if not configured for a map. In this case, electric fences and buildpath both fall in between 7 and 8 on the priorities list (can't remember off the top of my head which one takes precedence). Barrier doesn't seem to affect much at all other than allow you to turn barrier collection off completely if disabled. As for the unused priorities, Barrier and BuildPath both work, though BuildPath is actually useful and makes for a great replacement for Construction. BuildPath doesn't regulate your Raiders actually building Power Paths, but it regulates the priority of them finishing the paths. Now that is useful.... I might just entirely replace Construction with Path then. The 'default priority number' explains why on some levels, raiders will build the path then pick up ore, when on other levels raiders will pick up the ore, leaving the path unfinished.